Meet Teri. She’s another satisfied facelift patient of Dr. Brent J. Smith. 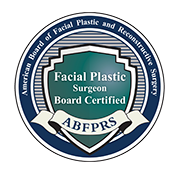 He’s made many people like Teri shine their brightest during a nearly 30-year career performing facial plastic surgery for people from Denver and around the country. Teri agreed to share her real story so that others who are considering facial plastic surgery will see that anyone can achieve their dream of looking—and feeling—naturally younger. But it does take courage. 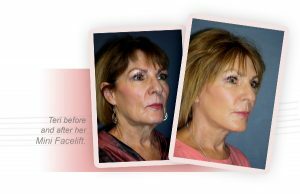 In her early 60s, Teri began to think more seriously about a facelift. Photos were the hardest. They revealed the droop in her jowls and wrinkles in her neck. She found herself straightening up and looking stiffly upward in an effort to stretch those signs of aging that seem to creep up quickly. She’d tried regular BOTOX treatments. But she knew that the regular treatments that kept her facial wrinkles at bay wasn’t powerful enough to address the lower half of her face and neck. But Teri was a little scared to make the decision to have surgery. She wasn’t intimidated by the operation itself, but rather the result that she might end up with. See, Teri’s friend had a facelift elsewhere. And the outcome wasn’t pretty. “I thought it looked so tight and unnatural,” she says. “You kind of see what you don’t want to look like.” But was there a doctor out there who could deliver a more natural result, simply a younger version of herself, Teri wondered? That’s when she got a few plastic surgeon referrals from her dermatologist. She went to see two: a generalist and Dr. Smith, who practices exclusively on faces and is double-board-certified. The first doctor told Teri that he performed a couple of facelifts each month, but did plastic surgery all over the body. He would also use general aesthesia to put Teri under for her face and neck lift. Her second visit was to Smith Cosmetic Surgery. Her husband was unsure about Teri undergoing surgery, so she asked him to come along. It was a free informational session, right? They had nothing to lose. He agreed. 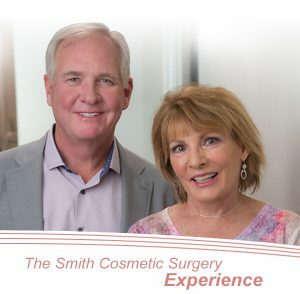 When the couple met with Dr. Smith, who conducts every new-patient consultation, Teri learned that the longtime Denver doctor only did plastic surgery on the face. He was a specialist. In fact, he told her that he performs five to six facelifts a week! 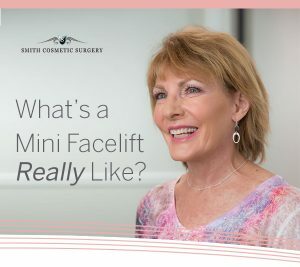 Then Dr. Smith told Teri something that put her husband at ease: The whole mini face and neck lift with a fat transfer from her belly could be performed under “twilight” anesthesia, a lighter, less aggressive sedative. That meant she’d never be fully “under.” And that was the selling point for Teri’s husband. For Teri, it was a combination of things that encouraged her to more forward with the facelift: Dr. Smith’s specialty; practice manager Lorayn Bower’s insight about her own experience of recently having a facelift by Dr. Smith; and compelling before-and-after photos. “Lorayn created an enhanced picture depicting the future me and once I could see those results, it really sold me,” she says. Teri signed up for the face and neck lift that she and Dr. Smith agreed would bring out her most natural features. She was 64 and it was June. She had no work to get back to and prepared herself for both the surgery and the recovery process, which she knew could be different for different people. Teri’s sister was another helpful support. A month prior to Teri’s procedure, she had undergone her own successful facelift in Texas. The two compared notes from afar. Teri’s procedure went exactly as planned. But the recovery process, as Lorayn had prepared her for, was challenging. And everyone responds a little differently, both physically and emotionally, to seeing a swollen face before the beauty shines through. “My immediate reaction was to the swelling,” she says. She wondered whether she was always going to look like this, even though she knew the truth: that the inflammation was only temporary. It would give way to a more youthful-looking Teri. She’d just have to take it day by day. So she did. Teri came in for seven days following her facelift to lay in Smith Cosmetic Surgery’s special hyperbaric chamber, a state-of-the-art oxygenation device proven to speed healing. “Lorayn and the Smith Cosmetic Surgery team always gave me such encouraging words,” she says. Having a support team worked. 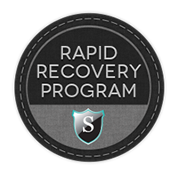 Recovery, even though it progressed at a perfectly normal pace, wasn’t a piece of cake. Lorayn was right. Teri just had to be patient. Since she wasn’t in a rush to get back to a job and didn’t feel the need to get out until she was completely healed, Teri gave herself a full five weeks before presenting herself to the world. And when she did resume normal activities, no one noticed. That might sound ironic, but that’s exactly what Teri wanted. Her results were so natural looking that she simply appeared like a healthy, confident younger version of herself. No taught cheeks. No masked necklines. Nothing fake. In fact, to this day she’s only told her direct family about the facelift. And that’s how she likes it. In a way, it’s her little secret—and an empowering one at that.